Do you have questions about using Bare It All shavers & trimmers? Q. How does a shaver whose blades do not touch the skin, shave as close as a blade or waxing? A. While it sounds counter intuitive an electric personal shaver with an ultra thin foil or guard can cut very close to the skin when it is dry, for a smoother longer lasting shaver than when you if are wet shaving using a safety razor or straight edge razor. Bikini or Brazilian waxing often leaves some hairs untouched and the waxing process itself is messy painful and expensive and can cause burns and allergic reactions. For longer lasting smooth skin you should always use an electric personal shaver never a man's face shaver. Shave or trim with dry skin, as shaving or trimming when the skin is wet always produces a rough finish. This is because your skin absorbs water though a natural process called osmosis. The skin cells swell and become "turgid" with water. This causes the skin cells to ride up the shaft of the hair concealing some of the hair shaft at the base at skin level. At this time the razor blade, shaver or trimmer can only cut the part of the hair shaft that is exposed and above skin level. When the water evaporates and skin cells deflate and contract, with the uncut part of the hair shaft exposed again. This reappearance of the hair shaft is what causes the roughness and explains why some think hair has grown back quickly after shaving. Q. What's the difference between a personal body razor or pubic shaver? A. Using any regular face shaver on your private parts can be painful because the skin is much thinner here and far more sensitive and the skin may protrude through the the larger holes in the foil and into the path of the blades. So the best and least expensive method is to remove unwanted hair with a single electric rotary body shaver which can easily get into all the nooks and crannies of the body. The Bare It All shaver has more features, longer lasting battery, titanium blades with a faster motor which all adds up to a faster, smoother shave at lower cost than other personal shavers or even wet shavers or razors and ahead of waxing or laser in terms of cost, safety and convenience. Q. What's the big deal about Titanium Blades? A. Titanium is a rare and expensive metal with great strength and used in the aerospace industries. The Titanium compound we use helps to make much sharper blade edges that simply lasts about 50% longer than the ordinary steel ones that other personal shavers have. Most shaver manufacturers hate this, as they want you to keep buying a new personal shaver or replacement shaver blades that soon wear out. Q. What kind of shaver is this and can men use it? A. It is a single head rotary, personal shaver and pubic trimmer, primarily intended for sensitive skin in the private parts area and can be most effectively used be used by BOTH MALE AND FEMALE of any race and ethnicity. The large flexible shaver foil with titanium hardened blades uses a powerful new direct drive motor operating at 8500 RPM. This doesn't lose power in transferring motion to the blades through gears, like the triple headed version of rotary shavers. This type of shaver has much smaller heads than the flexible single foil or screen, found on the Bare-It-All pubic shavers. Do not confuse the Bare It All shaver with other so called personal shavers which have vibrating (reciprocating) blades that move from side to side and which have coarse aggressive foils which may cause razor burn. These are primarily beard/face shavers suitable only for large areas of hair like on the chest or back and NOT the right choice for pubic shaving as your skin here is thinner and more sensitive and which has folds, and cracks and crevices not accessible with a broad body hair shaver. Some customers may not understand that the ultra thin and flexible foil on the Bare It All personal shaver and feel it is "flimsy" without realizing that this vital component is specially designed this way. This carefully designed hypoallergenic foil flexes and moves with the contours of the skin which allows the titanium infused blades underneath, to get really close to the skin but without touching or damaging the skin and causing the typical shaver burn, itching or rash. It goes without saying that you should never use excessive pressure on the foil as the skin may be pushed up through the foil into the path of the blades. Another useful tip is to dab the skin side of the foil with rubbing alcohol to remove transferred skin bacteria. This avoids skin rash or irritation. Q. Surely you must be cutting corners with quality to be able to sell at much lower prices than the other rechargeable pubic shavers? A. Absolutely not! Other stores and brands may do this but we do not. We offer features and value on our personal body shaver and pubic trimmers that can only be found on shavers that sell in the $100-$200 range. We have our staff in the factory to monitor the quality of the finished product as each shaver or trimmer comes off the production line. We believe in selling at the lowest price possible so that we can sell more or our pubic hair removal shavers and trimmers. This enables us to lower manufacturing costs and leverage product enhancement and innovation to a pint not found on any other pubic hair removal shaver or personal trimmer. We can therefore continue to offer tremendous value, reliability and service, which meets or exceeds that of any brand of shaver. With the Bare-It-All pubic shavers and body hair trimmers, you still get advanced design features, with the unique irritation free shaver foil and the added benefit of titanium hardened blades. The built-in slide out two pin adapter plugs straight into the wall outlet and runs on any household voltage from 100v to 240 volts worldwide. It has no clumsy cords, transformers, charging stands or adapters to get lost r to take up valuable space in baggage. Everything needed is built into the shaver. Q. Are these personal shavers new? A. Yes - brand new and unused, direct from the factory - SEALED and shipped direct to you. Each shaver is tested with nylon filament to see it is cutting correctly and adjusted and oiled. This is why our return rate is almost nil. At no time do we sell used or returned shavers under any circumstances, because of the personal nature of the product and potential of bacteria transfer. This is the reason for our limited 30 day satisfaction guarantee. Q. Is it safe to use my credit card over the Internet to buy your shavers and is my purchase confidential and safe? A. With us - absolutely safe! We are VERIFIED merchants with PayPal and Amazon and our online transactions are secured with the highest level of secure socket layers (SSL SHA2). We do not actually receive your credit card information, we only see the payment you send us via PayPal or Amazon who are the credit or debit card processors. This gives you added security & protection of your most sensitive data for all purchases made on our web site. Your credit card statement and the shipping packaging will NOT reveal what you have bought - just a charge from "Best Body Shaver" - owners of the Bare-It-All brand. Using your credit card is completely safe and FREE. Every credit or debit card these days, gives you zero liability in case of unauthorized or fraudulent use. You can even write to us with your full credit or debit card details and order information, to authorize us to charge your card. We also recognize that not everyone uses a credit or debit card. If you prefer, you can use your bank account or you can send us a USPS money order, available from any US Post Office. We ship your order worldwide from our warehouse, 85 miles north of Las Vegas, Nevada USA - within 24 hours of receiving cleared payment. Q. What if I don't like the shavers? A. Please take the time to tell us exactly what is wrong! Not following the instructions and poor user technique is the most common problem, coupled with skin that may be unaccustomed to dry shaving. Adjusting your technique and learning how to use our shavers to best effect may take about 2 weeks, especially if you have previously been used to wet blade shaving. If after a little practice, we cannot eliminate problems for you, simply email us for an RMA number and return the undamaged shavers with all packaging and accessories within 30 days of purchase. If there is a manufacturing defect as opposed to poor user shaving technique - we will promptly refund your money. If the shaver is in fact working correctly and the problem is due to user technique, we will not be able to make any refunds and you will be responsible for the return shipping costs. Please note packages sent without requesting an RMA will be refused and returned to sender. Q. Just how big is it anyway and does size matter? A. We will assume you are talking about the Bare-It-All, Personal Shaver and Bikini Trimmer and the answer, as with everything, it is not size, but technique, quality and design that matter. Our personal shavers have larger, faster motors, a single shaving head, a power cell that is twice the size of other personal shavers which means they have a much shorter product lifespan. Our personal shavers measure 4 inches high and 1.5 inches across the foil and is of course very discreet, portable and lightweight and slips into a pocket or purse very easily. Q. Are there any special techniques for using the Bare-It-All? A. As with every other foil shaver, the Bare It All shaver, can only cut short stubble or bristle. At least in the initial stage you must trim the hair to be shaved away - to short stubble length, using the built-in pop up trimmer. After that you may only need to use the trimmer for the occasional stray hair. After trimming to stubble length, hold the Bare It All shaver at an angle of 45-90 degrees and move it in circular motions, rocking the flexible convex surface over the skin. It is sometimes useful to use the "pinch a roll" technique, in which you pinch up a fold of skin and get the hairs on the top to stand up away from the skin, ready to be shaved by the Bare It All Shaver genital shaver. The technique of the user and following the product instructions is all important. Q. How long does the shaver battery last? A. It very much depends on how often it is used and how it is maintained. The Bare It All shaver and trimmer comes with it's own internal charger, which automatically senses voltages from 100 to 240 volts, and the miniaturized circuitry makes it very light. It has no bulky battery packs or external chargers with cords and charging stands, to weigh you down. The powerful long lasting "green" nickel hydride batteries are designed to accept over 500 recharges under normal operating conditions giving you about 2-3 years of use . Each full charge of 8 hours should be enough for more than 60 minutes for the Mk 3 model. The air temperature also affects the length of time it takes to charge. Rechargeable batteries certainly beat the single use, disposable ones, on both cost and power and our batteries do not utilize toxic heavy metals like cadmium, mercury or lead, nor the very flammable lithium variety. Q. Why is cleaning and oiling after each shave strongly recommended and how should I oil the blades? NOTE: Keep oil and solvents away from the soft touch non slip surface of the shaver, to avoid damage to the finish. Q. Are the Titanium blades replaceable? A. Yes! The shaver blades and foil should both be replaced together as a set and at the same time. The titanium strengthened blades are angled and held against the foil by centrifugal force and high tensile springs underneath the shaver blade rotor. 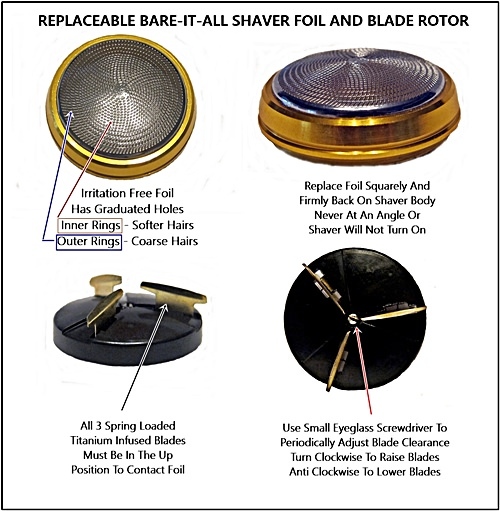 The blades are self sharpening as they rotate under the foil, and should last well over a year, depending on how often you use the shaver and your particular type of hair. Regular cleaning and oiling is very important and will extend and improve cutting performance. Once the blades start to wear down, you may notice the shaver is not cutting as well as it did. In this case you should adjust the blades upwards against the foil, using the following process. Unscrew the head and foil and you will see the tri blades, mounted on a black blade rotor. In the very center of this ABS plastic rotor is a small screw. With a small flat blade screwdriver, like those used for eyeglasses, you turn this to the right (clockwise) in one or more half turns, to raise the level of the blades so as contact the foil more firmly. Do not raise the blades too much or they will wear down quicker. When correctly adjusted you should be able to hear a slight resistance when you switch the shaver on and the blades should come to an almost immediate stop after switching it off accompanied by a swishing sound. Conversely turning the screw to the left (counter clockwise) lowers the blades but this should not be necessary. You should make blade clearance adjustments when replacing the foil and blades. You might want to order a replacement blade and foil set in case you lose or damage yours. Dropping these down the toilet happens more often than you would think. Discount replacement blades and foils can be ordered ONLY from us for much LESS than our competitors and are not available in stores. For $19.99 you get a replacement set with titanium blades, free foil guard, with free US shipping. Q. Are the rechargeable batteries user replaceable? A. 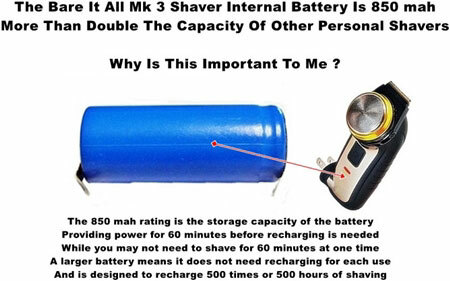 A replacement battery is available for the Mk 3 Bare It All All In One shaver. This has to be soldered into the shaver, and while this is easy we recommend that unless you are conversant with electronics you should have this installed at any electrical repair shop. Q. Can I use my Bare It All in other countries with a different local voltage? A. Yes! 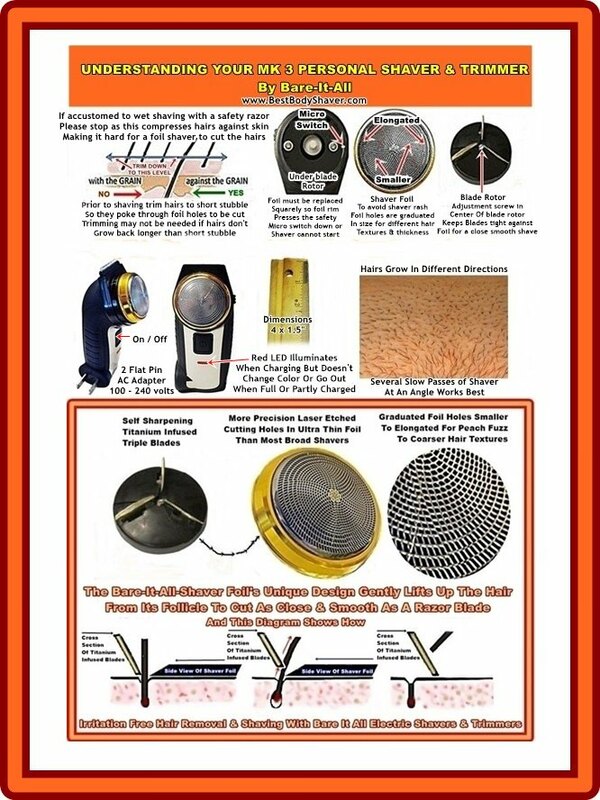 The Bare It All shaver will accept voltages from 100 volts to 240 volts AC. The shaver plug supplied is the US 2 flat pin style. Wherever you are in the world, the Bare It All pubic shaver and bikini trimmer can easily be recharged with no bulky transformer or cords needed, as everything is contained in the shaver itself. 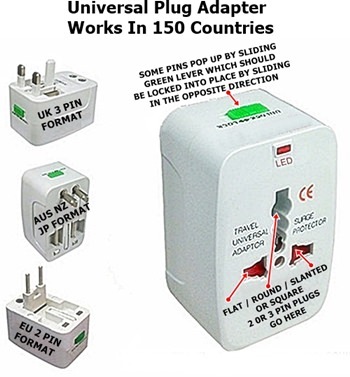 In some countries you may need a 2 or 3 round pin converter - we have universal travel adapters on this web site which work in over 150 different countries and can also be used for a hole range of electrical appliances like laptops, mobile phones, travel irons, hair dryers, coffee makers, kettles etc. Don't travel without one. Q. Will my purchase be private and confidential? A. Yes! We do not disclose to anyone what you have bought from us. We do not sell or share mailing lists. We also ship in plain packaging which does not disclose the contents. Your credit card statement will not show anything other than "Body Shaver".